ED note: The best way to read this is to download the PDF (above) as there are many illustrations that are not included here in the text. Whitesell, whose book is one of the most definitive scholarly works in print on Mitchell's music, supports his view of what may or may not be classified as "cyclic" using Ruth Bingham's definition of a song cycle, which, for him, seems most applicable to Mitchell's work: "In Bingham's description of the cycle, she emphasizes that coherence is not necessarily achieved through musical means, and in fact when Mitchell constructs cycles she works primarily with textual connections, concepts, or frames. Musical connections are supportive of a guiding textual rationale - in some cases perhaps accidentally so" (Whitesell 2008, 196). [More recent scholarship suggests that text may not have been the sole determinant in the conception of nineteenth-century song cycles. For example, David Ferris (2010, 398) noted that scholars are "further than ever from a definitive answer" to the question of what actually defines the quintessential song cycle, suggesting the issue is still under debate.] Using this viewpoint as a governing principle for his assessment and analysis of Mitchell's catalogue, he identifies ten of her releases as concept albums: six produced between 1968 and 1980 (Song to a Seagull, Blue, The Hissing of Summer Lawns, Hejira, Don Juan's Reckless Daughter, and Mingus) and four retrospective compilations produced since 1990 (Both Sides Now, Travelogue, The Beginning of Survival, and Songs of a Prairie Girl). However, he allows that "some listeners may wish to present arguments in favour of others as well" (199). This study is written in response to this invitation, offering evidence that Court and Spark (1974) is a song cycle and should therefore be added to the list of "inarguable concept albums" in Mitchell's catalogue. In this album Mitchell appears to have done the exact opposite of what Whitesell identified as her "usual" practice for achieving coherence. Although underlying textual themes unify the album's content to a certain extent, the musical elements play a more central role in forming the conceptual nucleus around which this album coalesces. These elements include motivic cross-referencing and return, segues between songs, pattern completion at key middle or background structural moments to define formal boundaries, and perhaps most surprisingly, a logical and symbolic progression of key or pitch centres that are directly related to the album's opening gesture. The presence and frequency with which these elements appear points to an overall musical structure that is much more than happenstance. Far from being an incidental aural vehicle for conveying Mitchell's poetry, the music on this album appears instead to be the result of a carefully planned compositional scheme in which the lyrics are only one active component. Since Mitchell's intent is always to create "art," all parts - text, music, and in some instances, album covers - are part of a whole. Therefore, an examination of all the unifying elements in this album - both text and music - only deepens the listener's understanding, enabling Mitchell to achieve her stated artistic purpose: that the listener see himself or herself in the work, for "at the point that they see themselves in it, the communication is complete" (Ghomeshi 2013). Concept albums and Mitchell's concept of "art music"
As early as 1971, music critics observed unique features in Mitchell's compositional style that lay in a nebulous area between popular and classical music. In his review of Blue, New York Times critic Dan Heckman called Mitchell's evolving style "art song," warning that this direction would not necessarily lead to the commercial success she had enjoyed as a "folksinger": "I suspect [Blue] will be the most disliked of Miss Mitchell's recordings, despite the fact that it attempts more and makes greater demands on her talent than any of the others. The audience for art songs is far smaller than for folk ballads, and Joni Mitchell is on the verge of having to make a decision between the two" (Heckman 1971). The "art song" terminology apparently resonated with Mitchell; in 1979 she told journalist Cameron Crowe that she preferred this description of her work over the catch-all "singer-songwriter" categorization, adding that she always knew what she meant by the word art, as cited at the beginning of this study (Crowe 1979, 48 - 9). Alice Echols quoted Mitchell as having said her music was not meant to have the short life that popular songs typically enjoy: "My music is not designed to grab instantly. It's designed to wear for a lifetime, to hold up like a fine cloth" (Echols  2002, 208). She told U.S. National Public Radio reporter Liane Hansen, "None of my songs on my records are folk songs ... They're more like German Lieder ... more classical than folk" (Whitesell 2008, 233). [National Public Radio is a non-profit news and information network jointly funded by the United States government and contributing listeners. Many NPR-affiliated stations are located on college and university campuses throughout the United States.] This was evident to critics; New York Times critic John Rockwell's review of Mitchell's Hejira (1976) called Mitchell "the artist best able to link folk-rock with the older Western tradition of the art song" (Rockwell 1976). Mitchell expanded on this view in 2013, during an interview conducted by Jian Ghomeshi of the CBC. Speaking of her first album, Song to a Seagull (1968), she said, "[The] first album is semi-classical. It's almost like Schubert, you know. It isn't folk music. It was kind of mislabelled from the beginning. Folksingers went out, bought it, put it on their turntables and went, 'What?' ... It's more like classical arrangements on the guitar. Like it's kind of classical guitar more than folk-style guitar" (Ghomeshi 2013). The connection between Song to a Seagull and lieder tradition extends beyond Mitchell's almost Schubertian approach to song accompaniment on the guitar. Each of the album's two sides is given a specific title ("Part 1: I Came to the City" and "Part 2: Out of the City and down to the Seaside"), each of which is based on differing key relationship schemes (Whitesell 2008, 199 - 200). Like a song cycle, the album is built on dramatic storytelling elements such as strong subsidiary textual motifs and a logical dramatic progression in song order from which a story can be inferred. Mitchell also did the artwork for the album cover (suggesting the album might be considered a "total work of art"). This artwork incorporates pictorial references to song lyrics; among other things, one finds a pen-and-ink drawing of a ship on a calm sea at sunset (presumably the Dawn Treader of the second song on Side 2), and a saguaro cactus on the back cover (referring to "Cactus Tree," the album's final song). Court and Spark is perhaps more textually preoccupied with themes native to nineteenth-century vocal art music than is Song to a Seagull . In a filmed interview Mitchell called it "a discourse on romantic love against the backdrop of its time" (Lacy and Bennett 2003). Like nineteenth-century song cycles such as Schubert's Winterreise or Schumann's Dichterliebe, the story implied in the album's song order follows the familiar, even epic, arc of a romantic relationship from its beginning to its end and aftermath. As occurs in both the Schubert and Schumann song cycles, the listener is allowed an intimate view of the effect that the relationship's demise exerts on the cycle's protagonist. Since textual preoccupation alone does not give a work cyclic properties, the question is whether Mitchell employs further poetic techniques that lend unity to the album. This possibility will be explored below. Crosby's hands-off approach made it possible for Mitchell to act as her own producer in subsequent recordings - a rare occurrence during this era. This ensured that she would have complete creative control over her work, including the supervision of song arrangements, instrumentation, and selection of the order in which songs would appear on any given album. That Mitchell has acted as her own producer for most of her career is a significant point when considering artistic intent and a musical style that evolved over more than thirty years and through a number of discernable style periods. The progression of her musical style over her first creative period (1968 - 72) can be observed in the five albums released prior to Court and Spark, which marks the beginning of her second style period. [Mitchell's first six albums are, in the order of their release: Song to a Seagull (1968), Clouds (1969), Ladies of the Canyon (1970), Blue (1971), For the Roses (1972), and Court and Spark (1974).] Three of her first four albums (Song to a Seagull, Clouds, and Blue) consistently maintain the folk-related style characteristic of her first creative period. A gradual influx of rock- and jazz-related idioms commences in her third album (Ladies of the Canyon, 1970) and continues through For the Roses (1972), her fifth release. This includes an expanding variety of guitar effects, Mitchell playing piano rather than guitar on many tracks, and the incorporation of backup vocals (most often done by Mitchell herself) and ensembles of varying sizes and instrumentations. Jazz musicians comprise these ensembles more often than do rock musicians and include woodwind players such as Paul Horn (the improvised clarinet solo at the end of "For Free" on Ladies of the Canyon) and Tom Scott (four of the tracks on For the Roses, 1972), whose L.A. Express serves as the backup band on Court and Spark . Court and Spark was a deliberate stylistic departure from her earlier work. [When] I realized how popular I was becoming was [sic] right before Blue, and I went, "Oh my God, a lot of people are listening to me. Well then, they better find out who they're worshipping. Let's see if they can take it. Let's get real." So I wrote Blue, which horrified a lot of people ... [What] had happened is they're looking at me, and all I've done is reveal human traits. They haven't seen themselves in it. At the point that they see themselves in it, the communication is complete. Court and Spark was, by Mitchell's assessment, also the beginning of a six- year period (1973 - 9) during which she experimented with the boundaries of what she defined as a "song" (Garabini 2000, 115 - 16). Her music became even more infused with jazz elements, almost completely eclipsing the folk idiom on which her reputation had been built. Court and Spark is also the first of her albums to feature a backup band on every track, beginning a trend that would continue for the remainder of her career. The albums that immediately follow Court and Spark become more jazz-infused, gradually adding notable sidemen such as bassist Jaco Pastorius, saxophonist Wayne Shorter, and pianist Herbie Hancock. Her second style period culminates in 1979 with the release of Mingus, which began as a collaboration with avant-garde jazz bassist Charles Mingus. This avant-garde jazz album is one of the most experimental of Mitchell's catalogue. Song to a Seagull is clearly a cycle or concept album unified by recurring textual themes, particularly the idea of geographic location. Six years later, when Court and Spark was created, Mitchell was at the beginning of a stylistic evolution that affected her music, her poetry, and the way the two interacted with one another. While the music takes on a greater organizational role, it is also more subtly interwoven with Mitchell's poetry, allowing for more varied textual unification. This section will address the more significant textual features that argue in favour of the cyclic nature of Court and Spark, particularly song order and recurring textual themes. When speaking specifically of Court and Spark later in this same interview, Mitchell said she is always "very protective of [her] structure," being careful that the musicians of the L.A. Express "wouldn't just scribble all over the architecture of [her] music" (14). If the artwork (either song or album) is the authority in Mitchell's eyes, and she intended this album to be a "discourse on romantic love," it seems reasonable to deduce that the song order here was deliberate. She would no doubt have seen it as a significant part of the "architecture" she took such care to protect. In this light, the song order on Court and Spark takes on more significance than it has perhaps been given credit. Mitchell's vision of the album as a discourse speaks more in favour of a logical, integrated textual progression that is more cyclic than random ordering. Moreover, a closer examination of the lyrics reveals recurring textual motifs that run through most of the songs on the album, the most pervasive of which are freedom versus commitment and sanity versus madness. Both motifs are intensified at key moments with religious imagery, which infuses the protagonist's struggle to maintain her freedom and sanity with bitter irony. The madness motif is introduced almost immediately in the album's first track, "Court and Spark" (see table 1). Here the female protagonist describes her new love interest as having "a madman's soul," who "dances up a river in the dark." "Help Me" describes the initial euphoria of new love as a "crazy feeling" that the woman knows will mean trouble for her. In the fourth and fifth songs ("People's Parties" and "The Same Situation") she says, "I told you when I met you / I was crazy" and describes herself as being "tethered to a ringing telephone / In a room full of mirrors." Later in "Just Like This Train," each verse ends with some version of the sentiment: "Jealous lovin'll make you crazy." These implications prefigure the subject matter of the final two songs. "Trouble Child" describes the painful inner world of the protagonist's mental breakdown, while "Twisted" expands upon that theme, bringing the madness motif to full fruition, as occurs in a piece built upon cumulative form techniques. We don't understand that everything on the album points toward the final two songs until we arrive, perhaps almost as surprised by the outcome they depict as the protagonist herself. The song order on the album follows the familiar Mitchell arc of a romantic relationship, this time with greater focus on its aftermath for both parties (Klein 2000, 2). This arc may be less apparent because, as is usual to her songwriting approach, Mitchell plays the role of storyteller (Ghomeshi 2013; Whitesell 2008, 41 - 77). As narrator, she takes on the persona of each character, frequently offering their points of view in first person, creating a "she said, he said" or a "she did, he did" scenario. Although most of the songs are told from the woman's perspective, "Free Man in Paris" and "Raised on Robbery" are either about the male love interest or are presented from his viewpoint, providing a glimpse of who he is - or who the storyteller thinks he is. Who's strong, and somewhat sincere." "Car on a Hill" (the sixth song) implies that the relationship ends unexpectedly in a poignant, almost cruel way. The protagonist waits for her boyfriend to come home one evening. However, the repeating fade-out ending, which consists of repeating chords built on suspensions, suggests that he never comes. "Down to You," which is the musical high point of the cycle, is an ironic "breakup song" that portrays the protagonist's emotional devastation as she realizes the relationship has ended. The album's final four songs provide glimpses of the aftermath of the breakup. The woman first waxes prosaic about the fickle nature of romantic relationships in "Just Like This Train." "Raised on Robbery" then portrays the man as unready for even a casual sexual encounter: he spurns a prostitute who tries to pick him up in a bar. The final two songs make it clear that the woman's "jealous lovin'" really did drive her crazy. "Trouble Child" depicts the melancholy, frightening inner world of the protagonist's mental breakdown, while "Twisted," written by Annie Ross and Wardell Gray, adds a more sardonic coda to the cycle, portraying the outer manifestations of the protagonist's madness. Mitchell called "Twisted" an "encore piece," explaining that she had always loved it, and it seemed to fit here. Further, because she had recently undergone psychotherapy, she felt she had earned the right to sing it (Marom  2000, 70). In the context of the implied plot, the presence of a cover version of a song written by someone else suggests that through her mental breakdown the protagonist has lost not only her love, but also the freedom she so cherished. With the loss of freedom, she has lost her individual voice as well and can no longer speak for herself. The switch from outward to inward focus at the beginning of the textual frame is reiterated in reverse order (inward to outward) in the final two songs. "Trouble Child" presents the inner world of the protagonist's mental breakdown, whereas "Twisted" reflects her outward behaviour. With the exception of "Free Man in Paris" and "Raised on Robbery," the alternating inside-to-outside narrative perspectives continue throughout the album. Both "People's Parties" and "The Same Situation" present the female protagonist's inner state, but they are linked by a musical transition that suggests Mitchell might have conceived them as the two halves of a single song. "Car on a Hill" is again presented in a narrative style similar to the title track, making it another of the female protagonist's outward expressions. The text of "Down to You" is written in the third person and is therefore more cryptic. Whether the storyteller is speaking directly to, about, or as the female protagonist (using "you" in the more colloquial sense) is never quite clear. Following the reasoning that a single popular song can contain a "multiplicity of voices," and that "the author 'inside the text' may inscribe the author 'outside the text,'" this song could actually present the thoughts of both the female protagonist and the narrator (Brackett  2000, 16). Either way, the text is clearly more descriptive of the woman's inner state, perhaps told in the third person because her inner self is so detached from reality that she sees her actions from the perspective of an observer. "Just Like This Train" then reverts to the protagonist's outside world. The narrative tone is once again more objective, as one relating thoughts or feelings to an associate. It is self-analytical: the protagonist compares her life to a train that's never "on time" and has "count[ed] lovers like railroad cars." The biting humour in this song, in lines such as "I can't find my goodness / I lost my heart / Oh sour grapes" further suggests an outward focus. The self-deprecating "Oh sour grapes" line suggests that she is outwardly putting the best face she can on her broken heart. These two songs do not follow the previously discussed outside-to-inside or inside-to-outside narrative pattern. Instead, their placement, as third song from either the front or back end of the album, defines the boundaries of the romantic relationship itself. The female protagonist is alone at both the beginning and end of the relationship - whether alone with her thoughts in the relationship's giddy early days, or alone with her neuroses after its demise. Because the lyrics are created to fit the music rather than the other way around, analysis of the music takes on greater significance. If, for Mitchell, the communication is complete only when the listener sees himself or herself in the song, understanding the music in conjunction with the lyrics only deepens the comprehension of the whole. The album's opening gesture: "Chords of Inquiry"
Court and Spark begins with a three-measure passage, played alone by Mitchell on the piano, which consists of a simple three-chord pattern (E - D - E - G), followed by a transitional phrase centred on G (see example 1). Although this passage seems harmonically innocuous, the gesture is completely unrelated to the remainder of the song. Indeed, Mitchell plays the F# at the end of the gesture as if it were marked with a fermata, aurally separating it from everything that follows. If this were classical music, one would immediately ask what function this opening gesture might serve. Mitchell explained in a filmed interview that her songs are often based on what she calls "chords of inquiry." Certain chords or chord patterns depict emotions for her; she prefers sonorities or progressions that "have a question mark in them" (Lacy and Bennett 2003). [Mitchell's songs often begin with what jazz musicians would call "sus chords" - chords with suspensions in them, which feature one or more sets of second intervals. She also frequently uses ninth chords whose third is missing, and the fifth, seventh, and ninth form a seemingly distantly related triad over the chord's root. Both types of "chords of inquiry" can be found in songs on Court and Spark . For instance, "Help Me" begins with Mitchell strumming an Asus2 on the guitar, and these specialized ninth chords are particularly prominent in the coda of "The Same Situation" (see example 5). Ninth chords voiced in this manner were part of a common harmonic language used by some of Mitchell's singer-songwriter contemporaries - most notably James Taylor (with whom Mitchell had a romantic relationship in the early 1970s) and Carole King. However, unlike those of Taylor and King, Mitchell's ninth chords don't always retain the harmonic function (usually as a dominant) implied by the bass note. Although they can be found in much of the popular music of the early 1970s, sonorities like these appear with particular frequency on James Taylor's Mud Slide Slim and the Blue Horizon (1971) and on nearly every track of Carole King's Tapestry (1971), Rhymes and Reasons (1972), and Fantasy (1973).] The gesture that opens Court and Spark is constructed almost exclusively of simple triads, but quite clearly "has a question mark in it" in at least three respects. First, its aural separation from the title song seems deliberate - so much so that it was omitted by the publisher from the sheet music, as were passages in other songs on the album that didn't fit then-current norms for popular sheet music. [These omissions include lengthier instrumental interludes, such as the seventeen-measure coda at the end of "The Same Situation," the two-minute instrumental break between verses of "Down to You," and passages that serve as both transition and introduction, such as the opening four measures of "People's Parties." While it is common knowledge that the published sheet music of any popular song cannot be considered its "definitive version," the piano transcriptions and reductions in this instance are surprisingly true to the recordings. As a result, omissions are all the more notable because they are sometimes nonsensical. By omitting the transitional four measures at the beginning of "People's Parties," the printed version of the song begins in the middle of a phrase (Mitchell 1974, 84).] Second, the opening three triads are voiced in second inversion, providing Mitchell's requisite "question mark" by placing more emphasis on the melodic line and drawing the ear's attention away from the chords' roots. Third, the cadence on G in m. 2 is open-ended, as a question would be. Rather than providing an immediate response, the transitional phrase in m. 3 leads the ear away from the question just posed, via the F#, into a narrative-style passage that is more obviously the title song's actual introduction. Mitchell has said her music and poetry are more deliberate, calculated creations (as opposed to painting, which for her is intuitive) (Ghomeshi 2013). Critics have noted this quality in her music since very early in her career, calling it "carefully constructed" and "fully composed, with rhythmic and textural intricacies in its own right" (Traum 1967, 8; Whitesell 2002, 175). One cannot therefore help but wonder, given the distinct separation of the opening gesture from the title song, whether the album as a whole might be a response to or working out of the question or "problem" posed here. If this were a classical work, one might immediately explore how or if the E - D - E - G chord progression, or "chords of inquiry," exert an influence on the music that follows. Because modality is typical in Mitchell's harmonic palette (making VII a common pre-tonic chord if a pitch centre is given a Mixolydian modal inflection), the E - D - E motion in the opening gesture in the very least suggests a motivic axis that could be realized harmonically, melodically, or both (Whitesell 2002, 176 - 78). The question is whether Mitchell does any or all of those things here. Keeping these possibilities in mind, the influence the opening gesture exerts will be enfolded into the discussion below. 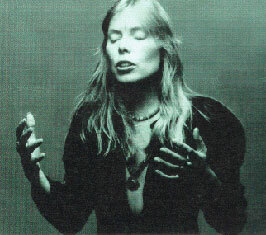 Unusual harmonies and chord progressions, which arise in part from her use of open guitar tunings, are among the hallmarks of Joni Mitchell's music (Feather  2000, 97). Although her harmonic practice on Court and Spark might be more "mainstream," stylistically closer to that of her singer-songwriter contemporaries than her other work, it appears to play an integral role in both text painting and in the unfolding of the proposed plot. As table 2 illustrates, all but two of the songs on this album are in one of only four key or pitch centres: E, D, A, and C. [E, D, A, and C are key centres that share common first-position chords used by beginning or amateur guitar players. However, this point may have little relevance for Mitchell, who often uses "open" guitar tunings of her own invention. One might also attribute the more triadic nature of songs on Court and Spark to either the constant presence of a backup band, Mitchell's more frequent use of the piano (her piano skills seem at least somewhat limited), or both. One anecdotal source suggests that Mitchell used "open" guitar tunings on this album, despite the implied relationship between the most common key centres and first-position guitar chords. In his description of the recording sessions for "Free Man in Paris," singer/guitarist José Feliciano recalled offering Mitchell advice on her guitar playing: "She was playing with her guitar in an open tuning ... so I pointed out that although open tunings are nice, they can be restrictive. I said that she'd be better off just to tune her guitar in the normal way. She didn't like that. I think it put her off me a little" (Black 2004).] Even the two seemingly extraneous keys, G and F# minor, are related to one or more of the four primary pitch centres either functionally, through a common connection to the opening "chords of inquiry," or both. For example, F# minor, the key centre for much of "Car on a Hill," is the relative minor of A, one of the four common keys. F# is also the held (and therefore emphasized) "pivot pitch" between the opening gesture and the formal introduction of the title track. E and D as key centres are part of the "chords of inquiry," as is G, which serves as a pitch centre in both "The Same Situation" and "Trouble Child." G is also the dominant of C - the key centre for both the protagonist's and the love interest's "aftermath songs" ("Just Like This Train" and "Raised on Robbery"). A quick overview of where and when these key centres occur suggests that their placement, via the order in which individual songs appear, might be deliberate, implying a symbolic connection between pitch centres and the plot proposed earlier. The practice of associating key centres with individual characters or concepts is, of course, a feature common to many song cycles. It is also consistent with Mitchell's concept that songs are musical paintings (Feather 2000, 93). Keeping in mind that painting is Mitchell's "primary language" (Ghomeshi 2013), key or pitch centre might function as a colour of paint that can be varied in hue or shading through modal inflection - a trait recognized as part of Mitchell's common harmonic practice (Whitesell 2002, 173 - 83). Mitchell's commentary on this issue is a bit contradictory: while she claims to never know what key she's playing in, she has also noted at least once that pitch centre can carry musical and even symbolic significance. While describing the creation of "Paprika Plains" (Don Juan's Reckless Daughter, 1977 - 78) in 1985, she explained that "C was home and that then you could venture out anywhere, and if you were meandering out there and you felt like you were lost, you wandered home to C. And then you departed again" (Hale 1985). Likewise the progression of pitch centres is logical enough to suggest that as Mitchell fleshed out the lyric content of the songs for Court and Spark, certain pitches and the colours they implied, if not the key centres themselves, became associated with characters and events in the story Mitchell intended to tell. It seems more than coincidental that E, D, and A are the pitch centres most closely associated with the romantic relationship (the key of C never appears until after the relationship has ended). Moreover, E, D, and G appear as pitch centres only when the female protagonist is speaking to or about herself, as in "Court and Spark," "People's Parties," or "Trouble Child." This strongly implies that E, D, and G - the three harmonic components of the opening gesture - may be signifiers of the female protagonist. A as a pitch centre, on the other hand, seems to be specifically associated with the male character. "Free Man in Paris" is in A, which is the only song in which the man's speaking voice occupies all but a few words of the text. This is not, however, the first time A appears as an influential pitch. It is first emphasized in the "knocking" triplet figure introduced in m. 4 of "Court and Spark." In a subtle bit of text painting, the A, as the dissonance in a 4 - 3 suspension, acts as an insistent "foreign object" that is resolved only momentarily (example 2). When the triplet figure is then altered to create the plagal cadence at the end of each section of the song, the A, subdominant in the key of E, naturally begins the figure (example 3). Mitchell further uses A as a pitch centre that struggles to dominate keys associated with the female protagonist. A as a conflicting key centre first appears in "Help Me," where each verse begins in A, but ends in D. Although "Free Man in Paris" is solidly in A, the A versus D conflict resumes in the introduction of "People's Parties," where Mitchell plays an A triad with a D bass on the acoustic guitar, reducing this power struggle into a single chord and pairing the protagonist inextricably with her lover (example 4). This sonority appears not only in the song's introduction but also at the beginning of each stanza of poetry. The psychological and emotional enmeshment portrayed by this vertical sonority is further borne out in "The Same Situation," which follows without pause, bridged by a modulatory transitional phrase. The song is a litany on the question, "How and why did I get myself into this?" and has a key centre that is deliberately ambiguous, featuring another pair of conflicting pitch centres: G and A. Although G (the cadential sonority from the "chords of inquiry") is the pitch centre, the circling chord progression on which the verse is built (C - G - D/E bass - E - Am) makes the end of each of these progressions increasingly powerful. The repeating cadences on A minor create musical question marks that enhance the meaning of the text, carrying such contextual weight that the few cadences that occur on G are rendered almost impotent by comparison, further weakened by the addition of major sevenths and ninths. Ultimately, A triumphs over G in the fourteen-measure tag at the end of the song. While the strings play a plaintive melody in 3/4 time accompanied by an A minor pedal, one hears the piano's right hand playing quarter-note quadruplets on a G triad against it in a four-against-three rhythmic pattern (example 5). Although the quadruplets are an almost visual portrayal of the lyric "I called out to be released," they are strikingly reminiscent of the "knocking" triplet figure in the introduction to "Court and Spark." However, the roles have been reversed here: the protagonist, not her lover, is knocking or pounding on the virtual doors or walls that imprison her. Chillingly, the knocking gradually slows, weakens, and disappears completely, swallowed by the A minor harmony that carries the final four measures. Both "Car on a Hill" and "Down to You" have dual pitch centres - shifting F# to A (keys associated with the man) and D to E (keys associated with the protagonist), respectively. In this, too, the key selection seems symbolic. Although the protagonist is speaking in "Car on a Hill," she is talking about her boyfriend who, like the fade-out ending suggests, all but disappears at the end of the song, as does his home key. This is the last time we hear the key of A in anything except as an occasional passing tonicization. It therefore makes sense that "Down to You," which begins in D and ends in E, is written in the protagonist's keys. She is left to herself to pick up the pieces of the relationship that has just abruptly ended. "Just Like This Train" is in C, but the sudden drop down to this pitch level is not as jolting to the ear because Mitchell has prepared the listener for it in several places during "Down to You," the song that immediately precedes it. Most notable among these places is the bridge, which is composed entirely over a C/D bass chord, which acts as a tension-building pedal over which a three-note melodic motive is varied and repeated. In context of where it appears in the cycle, C as a key centre bears a symbolic connection to emotional conditions lying outside the frame of the relationship defined by the E - D - E axis in the "chords of inquiry." It is a "lower" pitch, suggesting an emotional letdown and therefore may be a harmonic "response" appropriate to songs dealing with the aftermath of the relationship. Musically, it lies outside the boundary set by the "chords of inquiry," yet is related to them via its dominant, G. It is where both parties go after the relationship ends. The harmonic "flat line" created by C serving as the key centre for two songs in a row - "Just Like This Train" and "Raised on Robbery" - particularly after the harmonic variety displayed in the key centres of the preceding songs, implies that the breakup may have been hard on both parties. But for the female protagonist in particular, the C pitch centre may be illustrative of the depths to which she sinks, both away from self-respect and sanity. The key centre of "Trouble Child" is perhaps appropriately ambiguous; it seems to be in both C and G at the same time, thus fusing a relationship between C and the G from the "chords of inquiry." "Twisted" serves as a sardonic coda for the cycle. It is in D, suggesting, if the pattern of characterization by key centre is still intact, that the woman might be in a phase of recovery; she never returns to E, because she is clearly not the person we met at the beginning of the cycle. The foregoing discussion of key relationships has alluded to the idea that in addition to the opening gesture's influence on issues of pitch centre, it also acts as an underlying motive that functions as a scaffolding in the deep background upon which the entirety of the album is built. This "controlling motive" surfaces at key structural moments during the cycle. The "chords of inquiry" appear either as key centres or as opening sonorities of songs related to the romantic relationship (see table 2). "Court and Spark" is in E minor, beginning on E chords in both the album's opening gesture in m. 1 (E major) and in the actual introduction in m. 4 (Em7). "People's Parties" is in D, suggesting a middle-ground realization of the E-D-E axis implied in the opening gesture. Then, despite vacillating between G and A minor, D is prolonged in the background of "The Same Situation" via the opening A/D bass sonority that also begins each verse. The second E major chord from the opening gesture first reappears as the opening chord in the transition between "Car on a Hill" and "Down to You," despite D serving as the primary key centre for the majority of the song. The first few measures of this transition are, in fact, a harmonic variation and expansion of the "chords of inquiry," minus the repeated E triad (example 6). Although the second sonority in this passage is a Bm7, Mitchell has preserved the second-inversion voicing of the D triad in the right hand. We see the E-to-D motion from the opening gesture once again at the end of the first verse, where the E triad, again in second inversion, appears as an accented passing chord (example 7). E major is heavily emphasized again at the end of the tune, which, because of its lengthy instrumental break, carries greater musical weight over the album as a whole. Its weight is further emphasized because the E - D - E axis pattern running through the deeper middle ground of the album is completed in the coda of "Down to You" (example 8). Given that the bulk of this song is in D, identifying the coda of "Down to You" as the structural moment where the axis pattern is completed in the background (symbolizing the end of the romantic relationship) is the most logical explanation for the unusual emphasis placed on E major in this song, particularly why it ends in E.
While the end of "Down to You" acts as the background closure of the E-D-E axis, the full E-D-E-G pattern suggested by the "chords of inquiry" is fully completed on the background level in the penultimate song on the album. Although the key centre of "Trouble Child" is ambiguous at first, G is the tonic that emerges at the end of each verse, as well as at the end of the song itself. Given that Mitchell called "Twisted" an "encore piece," it seems that she considered "Trouble Child" the actual end of the cycle. Therefore it seems fitting that the cycle's final piece before the encore be in the key of the final "chord of inquiry." Given the topic of the text, the song may also serve as the ultimate sad response or resolution to the question posed at the beginning of the album by the opening gesture. Another musical element that seems to confirm the cyclic nature of Court and Spark is the previously mentioned "knocking" triplet figure that first appears in the introduction of the title track. When it first enters in mm. 5 - 7 of "Court and Spark" (see example 2), it seems no more than a subtle bit of text painting that introduces A as the "foreign object" pitch. When it recurs later in the song (example 3), it takes the form of an extended and reversed version of what Allan Moore called the "extended plagal cadence" (Moore 1995, 191). Moore's version of this cadence is VII-IV-I (which in this tune would be D-A-E); Mitchell reverses the VII and IV, adding an intermerdiary tonic chord, making the progression IV-I-VII-I (A-E-D-E). Although Moore emphasizes the commonality of the VII-I cadence in popular music, Mitchell's use of it here appears to serve another text-related purpose. Here A and E (IV and I in this key) are the two sonorities on which greater emphasis is placed. This is accomplished by accenting the A chord at the beginning of the figure, then holding the final E chord for two beats. Thus although the figure is made of four sonorities, one perceives the IV and I as its primary harmonic components. The three-fold repetition of the figure not only communicates the insistence of the "knocking," but emphasizes the cadential formula's plagality. It sounds like a series of repeated "Amens," reinforcing the religious imagery in the lyrics. Since the man is described in evangelical terms and the protagonist's acceptance of him akin to a religious conversion, the plagal cadence here is analogous to the "Amen" response one might hear sung by a choir at a religious revival. The triplet figure, or others that allude to it either rhythmically or gesturally, recurs periodically in strategic places throughout the album, particularly in songs connected to the romantic relationship. It appears in the coda of "The Same Situation" first as a triplet, then expanded into a quadruplet (see example 5). Here the connection to the initial triplet figure in "Court and Spark" is two-fold. The rhythm recalls the "knocking" figure, and the repeated G triads symbolize the woman pounding on the walls of the emotional prison in which she finds herself. The twenty-six-measure instrumental break in "Car on a Hill" is based almost entirely on the triplet figure, both literally and figuratively. It is first introduced quite cleverly three measures into the interlude by the interjection of a 3/4 bar (m. 24), which suspends the driving beat throughout the break, creating the impression of a more ethereal space where the sense of time is nearly lost (example 9). A rhythmic variation of the triplet figure also appears in this interlude. Here Mitchell takes the idea of three notes grouped together and relaxes the stricter triplet rhythm. She begins with the 3/4 bar in the third measure of the interlude (m. 24) with quarter notes on each beat, then softens the strict three-related rhythm two measures later by syncopating it. Three measures later this figure is transformed into a syncopated pair of arpeggiated triads, which is a variation of the introductory material played by the piano at the beginning of "The Same Situation" (example 10). One immediately hears the rhythmic relationship between what has come before and the triplet figure the moment it enters in m. 29. That Mitchell sees the arpeggiated figure and the triplets as interchangeable is confirmed as the break continues, with the two figures alternating back and forth. These figures are again united in the fading tag at the end of the song, perhaps again for symbolic reasons. Since the triplet figure always appears in some context related to the male love interest, the pairing of the triplet figure and its related arpeggiated eighth-note figure may symbolize the ongoing conflict between the protagonist and her lover - something that ends with this song. The triplet figure resurfaces at one more symbolic juncture in "Just Like This Train." In the concluding verse, quarter-note triplets are used to accommodate keywords in the acerbic lines, "Dreaming of the pleasure I'm gonna have / Watching your hairline recede, / My vain darling." The triplets occur on the words referring to the ex-lover's receding hairline, adding to the bitter sarcasm of the lyric. More significantly, the triplet figure appears in a line where the protagonist is referring directly to her ex-boyfriend, further connecting the figure to his character. In addition to harmonic and motivic elements that link the songs on this album, they are also connected through transitional material that clearly unifies them into a single narrative. These transitions are generally of two types: (1) a passage carried through the track-separating bands on the original LP, which, through the extension of musical material that precedes it, either softens or eliminates the effect of a hard final cadence; or (2) an introduction that recalls material from some pertinent part of the song immediately preceding it, through either quotation or variation. Table 3 summarizes the types of transitions between songs in the cycle. The two right-most columns may refer to the introduction of the song below it. One could point out many things about the musical aspects of these transitions. For example, it seems significant that the introduction of "Free Man in Paris" is based on the harmonic structure and rhythm of the figure that accompanies the word freedom in the preceding song (example 11). The link between the two is clearly a musical allusion to the dichotomy between autonomy and commitment, and more particularly the longing for no commitments, which is what the chorus of "Free Man in Paris" describes. Sometimes transitions carry the musical commentary beyond the final cadence of a single song, as is evident in the transition between "People's Parties" and "The Same Situation." In the introduction to "The Same Situation," the piano begins by playing the accompanimental material for "Situation," but in the key of "People's Parties." The key doesn't change until the singer enters. While the D pitch centre of the introduction serves as a dominant preparation for G, the change of key seems a little abrupt, perhaps even purposely so. Perhaps the most poignant of these overlapping transitions is the passage linking "Car on a Hill" and "Down to You" (see example 6). As previously pointed out, "Car on a Hill" ends with alternating variations of the quarter-note triplet figure. Although the tag of "Car on a Hill" fades out, the melody line of the piano introduction takes the eighth-note rhythmic variation of the figure in the first of the two repeating measures and restates it much more slowly and freely in the new key. The tempo and manner in which the figure is played indicates what has happened more eloquently than any lyric could. While it is not the most complex of the transitions, it is one of the most communicative - adding yet another teasing bit of evidence that the album is a song cycle. This study has highlighted a number of textual and musical elements that argue in favour of the cyclic nature of one of Joni Mitchell's most commercially successful albums. It has been shown that although oblique on the surface, two sets of conflicting textual ideas - freedom versus commitment and sanity versus insanity - run through the entire album, loosely tying the songs together and suggesting a plotline that follows the arc of a romantic relationship. This plotline is also unique in that the final four songs on the album describe aspects of the relationship's aftermath for both parties involved. Perhaps the most intriguing facet of Court and Spark, however, is that the album's cyclic properties are strongly supported through musical elements - a point that runs counter to what has been defined as Mitchell's more usual rationale of organizing cycles around textual connections. The presence of unifying musical elements suggests that for Mitchell, the music on this album may fill a more significant role than that of a convenient vehicle for conveying the text - a common assumption for singer-songwriters whose output is perceived to have followed in the stylistic footsteps of Bob Dylan. However, recognizing that the music exerts a stronger influence on the outcome of the whole is more in line with the way Mitchell has described her songwriting process. Because she has said she usually creates the musical structure first, her lyrics may serve a different function. If the harmonic structure or individual chords represent emotions or ideas to Mitchell, the text then becomes an articulation of the music, fusing both into a single entity like an item cast and hardened in a mould. Looking at Mitchell's music this way adds a new significance to the "careful construction" music critics described in her music from very early in her career ("Joni Mitchell" 1969). In Court and Spark, Mitchell has employed unifying musical elements with the deftness of a skilled composer, and too consistently for the music to be anything but carefully planned. One might ask how this could have been possible, given that Mitchell had little to no formal musical education and claims to be largely unaware of many of music's more technical aspects. Ignorance of traditional musical terminology, theory, or practice does not necessarily preclude the ability to carefully plan the music one writes. Mitchell told Jian Ghomeshi in 2013 that while painting is more intuitive for her, the creation of music and poetry are deliberate, even calculated acts. She briefly described her basic compositional method, much of it aurally based, to music journalist Leonard Feather in a 1979 interview: "I see music very graphically in my head - in my own graph, not in the existing systemized graph - and I, in a way, analyze it or interpret it, or evaluate it in terms of a visual abstraction inside my mind's eye" (94). Although Mitchell's idiom lies in the realm of popular music, the process she describes is in fact conscious composition, her "internal graphing system" not far removed from that of classical avant-garde composers who experiment with alternative notational systems. The unifying musical elements of Court and Spark identified here argue in favour of that conscious composition - a process not exclusive to any particular genre of music. Any composer, regardless of genre, employs similar systems of internal evaluation and organization during the compositional process. The study of Joni Mitchell's music is in its infancy. As scholars develop ways of looking at her unique output, both text and music need to be addressed without attributing greater importance to one or the other. Where the two are often created together or in close succession, to emphasize one over the other in importance may mean to miss significant components that would lend a deeper understanding and appreciation of the whole. If, as Mitchell recently said, understanding is complete only when one sees oneself in the work (Ghomeshi 2013), perhaps looking at the way the two interact and support one another is a step toward that understanding. In the case of Court and Spark, ignoring the way the musical elements unify the album into a single narrative may mean to miss the message contained in her "discourse on romantic love." As Mitchell told Ghomeshi, the point is that each of us sees ourselves in the music - we identify with Court and Spark's protagonist, in all her insecurities, uncertainties, hurt, and even insanity. For when we see ourselves, or human nature, in the music, the communication is complete. Beatles, The. (1967) 1987. Sergeant Pepper's Lonely Hearts Club Band . Produced by George Martin. EMI CDP 7 46442 2, CD. - - - . (1969) 1990. Abbey Road . Capitol CDP7 464462, CD. Bingham, Ruth O. 2004. "The Early Nineteenth-Century Song Cycle." In The Cambridge Companion to the Lied, edited by James Parsons, 101 - 19. Cambridge, UK: Cambridge University Press. Black, Johnny. 2004. "The Best Songs Ever! Free Man in Paris." Blender (September). http://jonimitchell.com/library/view.cfm?id=1171&from=search. Brackett, David. (1995) 2000. Interpreting Popular Music . Cambridge, UK: Cambridge University Press. Reprint, Berkeley: University of California Press. Brooks, Ben. 1982. "Joni Mitchell's Independent Art." Music Connection: The Alternative Trade Publication 6 (24): 1, 9, 14 - 15. Chicago. 1970. Chicago II . Produced by James William Guercio. Columbia KGP 24 CS 9962, LP. Stone, 26 July, 46 - 53. Echols, Alice. (1994) 2002. "'The Soul of a Martian': A Conversation with Joni Mitchell." In Shaky Ground: The '60s and Its Aftershocks, 207 - 20. New York: Columbia University Press. Originally published as "Thirty Years with a Portable Lover." Los Angeles Weekly, 25 November. Feather, Leonard. (1979) 2000. "Joni Mitchell Makes Mingus Sing." In Luftig 2000, 89 - 103. Originally published in Downbeat, 6 September. Ferris, David. 2010. Afterword. In John Daverio, "The Song Cycle: Journeys through the Divine Landscape," revised and edited by David Ferris. In German Lieder in the Nineteenth Century, edited by Rufus Hallmark, 363 - 400. New York. Routledge. Garabini, Vic. 2000. "Joni Mitchell Is a Nervy Broad." In Luftig 2000, 113 - 33. Ghomeshi, Jian, prod. 2013. CBC Music Exclusives: The Joni Mitch- ell Interview . Canadian Broadcasting Company. Broadcast 15 June. http://music.cbc.ca/standalone/embeddedvideopage. aspx?type =concerts&object=CBC-Music-Exclusives-The-Joni-Mitchell-Interview -2013 - 06 - 04&videotitle=The-Joni-Mitchell-Interview-A-CBC-Music -Exclusive& permalink=%2Fembedded%2Fconcerts%2FCBC-Music -Exclusives-The-Joni-Mitchell-Interview-2013 - 06 - 04%2Fvideos%2FThe -Joni-Mitchell-Interview-A-CBC-Music-Exclusive. Hale, Tony. 1985. "Rock Master Class Interview." Broadcast 29 December. Capitol 98.5, UK. Transcribed from the audio by Lindsay Moon. http:// jonimitchell.com/library/view.cfm?id=646&from=search. Heckman, Dan. 1971. "Pop: Jim Morrison at the End, Joni at a Crossroads." New York Times, 8 August. "Joni Mitchell." 1969. Rolling Stone, 17 May. http://jonimitchell.com/library/ view.cfm?id=312&from=search. Klein, Larry. 2000. Liner notes in Joni Mitchell, Both Sides, Now, 2. Reprise Records 9 - 47620 - 2, CD . Lacy, Susan, and Stephanie Bennett, prods. 2003. Joni Mitchell - Woman of Heart and Mind: A Life Story . London: Eagle Rock Entertainment, DVD. Luftig, Stacey, ed. 2000. The Joni Mitchell Companion: Forty Years of Commentary . New York: Schirmer. Macan, Edward. 1997. Rocking the Classics: English Progressive Rock and the Counterculture . New York: Oxford University Press. Marom, Malka. (1974) 2000. "Joni Mitchell: Self-Portrait of a Superstar." In Luftig 2000, 66 - 74. Originally published in Maclean's, June. Mitchell, Joni. (1968) 1990. Song to a Seagull . Produced by David Crosby. Reprise 693 - 2, CD. - - - . 1974. Court and Spark . Piano-vocal score. Crazy Crow Music, division of Warner Publications. - - - . 1998. Joni Mitchell: The Complete Poems and Lyrics . Toronto: Vintage Canada, division of Random House. - - - . Miles of Aisles . (1974) 1990. Live double LP with Tom Scott and the L. A. Express. Elektra B000002GWN, CD. Moore, Allan. 1995. "The So-Called 'Flattened Seventh' in Rock." Popular Music 14 (25): 185 - 201. RIAA. "Searchable Database." http://www.riaa.com/goldandplatinumdata .php?table=SEARCH_RESULTS. Rockwell, John. 1976. "Joni Mitchell Recaptures Her Gift." New York Times, 12 December. Sonenberg, Daniel. 2003. "'Who in the World She Might Be': A Contextual and Stylistic Approach to the Early Music of Joni Mitchell." PhD diss., City University of New York. Traum, Happy. 1967. "Joni Mitchell." Rolling Stone, 17 May. White, Adam. 1990. The Billboard Book of Gold and Platinum Records . New York: Billboard Publications. Whitesell, Lloyd. 2008. The Music of Joni Mitchell . Oxford: Oxford University Press. Current scholarship recognizes several of Joni Mitchell's albums as being cyclic, or based on a unifying concept. Court and Spark (1974), however, is not numbered among them, despite Mitchell's having described it as "a discourse on romantic love." Following the inference that this album may have been conceived as an extended, multi-movement work, this article examines both its textual and musical aspects, seeking unifying characteristics. The cyclic nature of the album is uncovered, showing it to be more unified from a musical perspective than a textual one. This approach is the opposite of Mitchell's perceived norm, suggesting her compositional process may have been more sophisticated than is currently thought. La recherche actuelle reconnaît que plusieurs albums de Joni Mitchell sont cycliques, ou basés sur un concept unifiant. Toutefois, Court and Spark (1974) ne fait pas partie de ces albums, bien que Mitchell l'ait décrit comme « un discours sur l'amour romantique ». En se basant sur l'idée que cet album pourrait avoir été conçu comme une œuvre d'ampleur à plusieurs mouvements, cette étude examine ses composantes textuelles et musicales dans le but de rechercher ses caractéristiques unifiantes. On y met en lumière la nature cyclique de l'album, en montrant que l'unité de ce dernier repose davantage sur ses aspects musicaux que sur ses aspects textuels. Cette approche va à l'encontre de la perception habituelle de l'œuvre de Mitchell, et propose que son travail compositionnel serait plus recherché que ce que l'on pense habituellement. This article has been viewed 472 times since being added on April 5, 2019. Bravo, I am reading this as I am writing this posting, The first album is really the opening act Song to a Seagull (1968) clearly from the point of view of wonder, sung from small stages (2nd Fret in Phila Pa) painted sidewalks and fire escape stairs to the highway ribbons call of Bright Lights and sad refrains of stardom Court and Spark. I, like many Joni Mitchell fans, were always amazed and we were part of that wonder she sung about, yes both male and females fans. Reading the essay on this masterpiece, brought a slight tear to my eyes, my youth, running wild on Sunset and Vine or watching the sunset on the beach in Malibu. I have to go play this album now, So I can sit back, let my mind's eye wonder back in time when one sunny day taking a shortcut I bumped into Joni, Court and Spark playing on the 8 track, VW BEETLE yet as I saw her familiar face I could hear the refrain from another time and place "the Pirate of Penance", as I stood there, not knowing what to say, I thought That was from another time and play.